I've reviewed all the Proporta Turbochargers so far and the trend so far has been for bigger and bigger, higher and higher capacity. At the expense of the accessory getting larger as well, of course. And now we have a lovely slice of lateral thinking in this, the unique Turbocharger Pocket Power, no larger than a credit card and only slightly thicker, yet able to deliver at least half a charge into (or to power) your smartphone in an emergency. What a wonderful accessory, here's my illustrated review. Previously, the concept behind the Turbocharger range had been to provide a reservoir of power capable of fully recharging your phone when out and about - or, in the '7000's case, charging it 3 or 4 times! The 7000 model provides the core of my 'away from home' toolkit, and has charged everything from phones to an iPad to a Nintendo DS. The extendable adapter cable and 'tips' from the other Turbochargers have been left off, to keep things simple. Among other things, it means you don't have to keep the Pocket Power in a little velvet bag, to keep all those fiddly tips together. As with the Nokia DC-11, the main microUSB output flying cable and connector are integral, in that they fold back into the body of the charger - very neat. 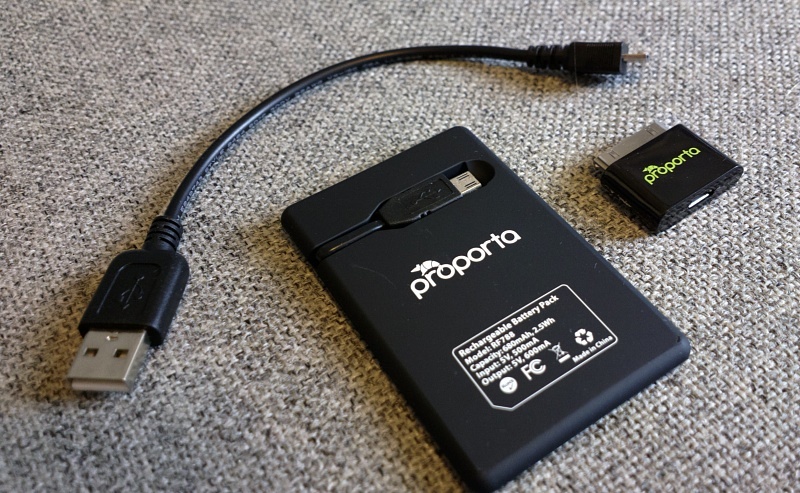 Rather than go for outright capacity, the idea here is to see how small the charger can be made, to the point where it fits into your wallet as a credit card. In practice, the 680mAh (2.5Wh) is discharged at up to 600mA, which means it takes roughly an hour to transfer the charge into the smartphone of your choice. Even after typical transfer inefficiencies, this is still equivalent to half a charge of a typical phone. The use case here isn't the typical Turbocharger aim of providing 'all purpose charging while away from mains power' - with the Pocket Power it's about realising that your smartphone's running short on battery charge at 4pm and whipping this miniature charger out of your wallet to make sure you get home and through the evening with power to spare. In the sales package you get the Pocket Power itself, plus the aforementioned optional adapter to iPhone, plus a somewhat redundant USB-to-microUSB cable to charge the accessory up with. I say 'redundant' because most purchasers will already own multiple microUSB mains or USB cables, so charging the Pocket Power is unlikely to be a problem. Maybe the inclusion of this small cable is another gesture to the iPhone-using community - I guess it's possible that they might not own any microUSB hardware? 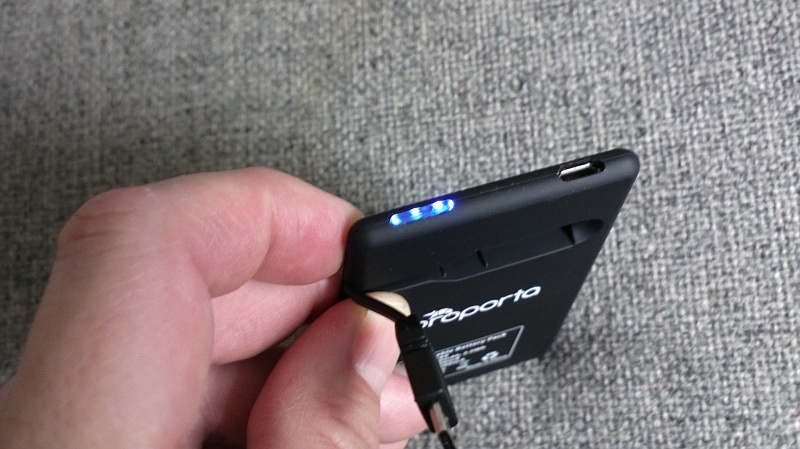 For most users though, just taking the Pocket Power will be enough, slipping into a corner of a pocket or into a wallet. The microUSB output cable/connector sit beautifully snugly in the Pocket Power's body, with the connector side perfectly flush. Aside from the logo and specs, the only other distinguishing features are the microUSB input port (charging at 500mA) and the LED button on the top edge. Press and hold this at any point and the three LEDs will indicate roughly how much charge remains in the Pocket Power. When charging, the LEDs cycle, to indicate something's happening. It's a simple and elegant system, plus having to press and hold helps ensure that the LEDs don't keep getting activated in your pocket or wallet, which would then waste charge. 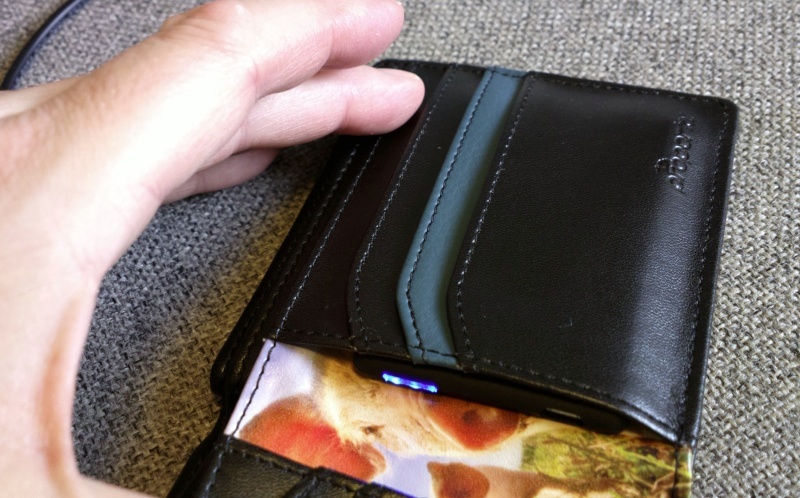 Of course, even in your wallet (shown below), you can do a quick long press at any point to check it's charged and ready without taking the Pocket Power out. Included as a nod to the iPhone owners who might also want to take advantage of an extra partial charge, here's the microUSB to iPhone adapter up close. 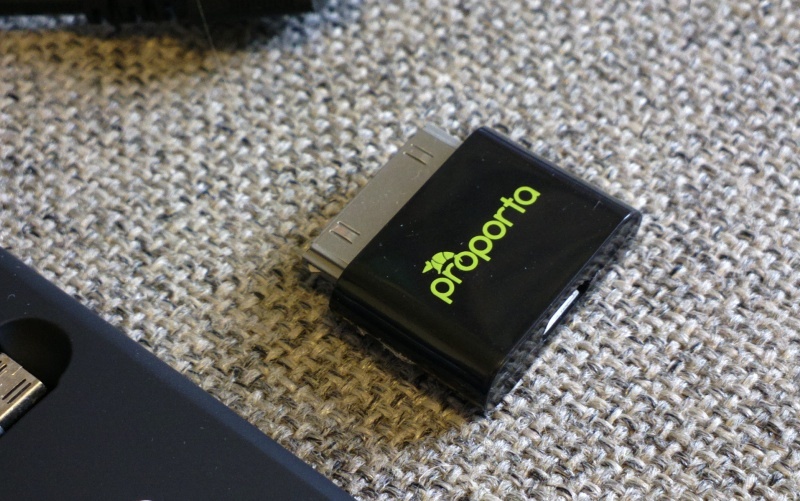 The inclusion of this is really rather splendid, in my view, not least because Apple charges £8 for a similar adapter, while Proporta is throwing it in as a freebie on a really useful £12 accessory. Well done. What we have here then is a top quality, diminutive little emergency charger that's largely self-contained, easy to stow away whatever your outfit or appareil and which doesn't cost the earth. 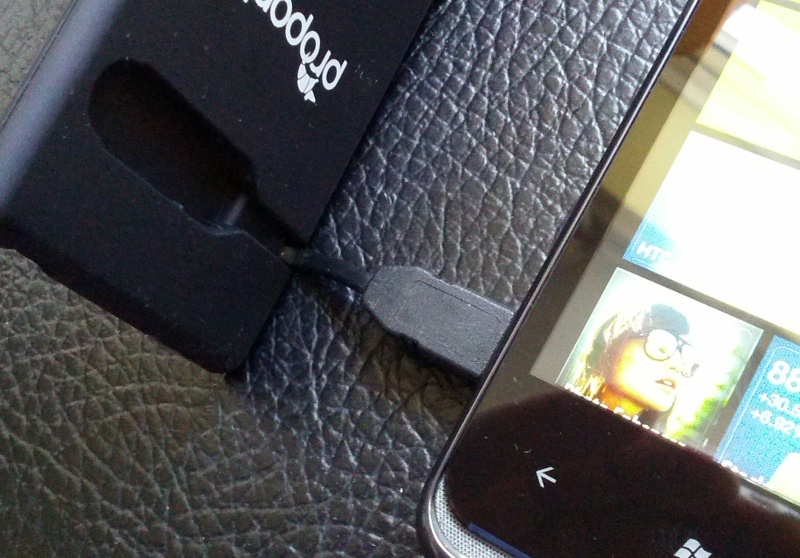 I also tested the Turbocharger Pocket Power with the Nokia 808 and had no problems in terms of voltages or detection of charging. Interestingly, you don't need to press a button to start charging in each case - the accessory detects that something's connected and starts supplying power immediately. Lest you suspect that I'm turning into a Proporta fanboy(! ), note that, although I'm generally a Turbocharger fan, the (previous smallest) '1200' model was a little pointless in my eyes. It had much of the bulk of the larger models and all the complexity of bags, tips and cables, but this Pocket Power variant approaches the whole problem from a different direction and scores a big hit along the way. Highly recommended, this small, cheap and effective addition to the Turbocharger accessory line just won my heart. And a killer review score of 95% here on the 'All About' sites - I can't find any way to fault it. Here's the main Proporta product page for the Pocket Power.